This week, Your News to Know rounds up the latest news involving the gold market and the overall economy. Stories include: The gold rally you’ve been waiting for is coming, the yellow metal is still a good insurance policy as rates rise, and gold’s good week gets better over trade war fears. An article on TheStreet reported on precious metals expert E.B. Tucker’s meeting with Kitco where he shared his predictions for the gold market. Tucker and his team are certain that a major rally in gold is coming, and the relative obscurity of its indicator could catch everyone by surprise. He pointed to the skewed gold/silver ratio as a major indicator of the yellow metal’s future trajectory. Although the gauge was designed around a ratio of 15-1, it has slowly expanded over the years and now rests close to 90-1. As market watchers turn their attention elsewhere, Tucker is adamant that this is a strong enough indicator to call for a move into gold, adding that his team has been strategizing accordingly. The Casey Report editor said that such a wide ratio has only occurred four times over the last 20 years and has acted as a foolproof signal throughout that stretch. When asked about the view of some investors that the gold market can be too calm to post a profit, Tucker stated that this is the rally the gold bulls have been waiting for. While noting that physical gold investment revolves primarily around protection, he added that the strength of the coming upswing should be sufficient for bullion owners to get a significant short-term return. Ahead of last week’s Federal Reserve meeting, bullion firm Degussa argued that gold retains its spot in a portfolio regardless of any actions that the central bank might take. Degussa’s analysts outlined several reasons why investors can’t afford to overlook gold in times of lower prices, as these represent an attractive opportunity to diversify any portfolio. The lack of stability that fiat currencies have remains a key tailwind for gold, with the dollar’s performance against the metal in recent months being a notable example. 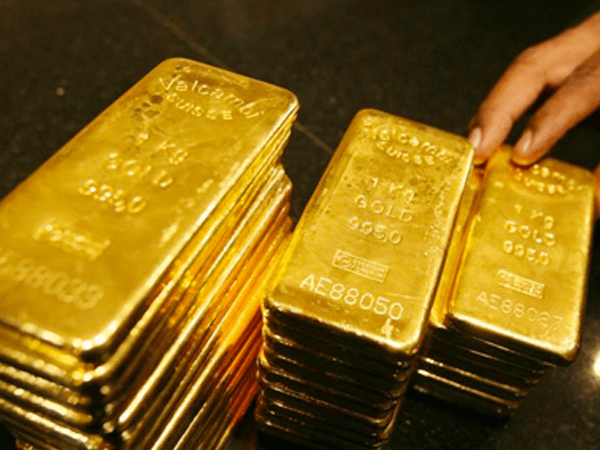 However, the analysts also noted that gold has outperformed a basket of other currencies and is starting to be viewed as a good choice for a global currency. Besides this, the team also noted that the Fed’s tightening could ultimately lead to a recession, as many have warned in the past. Although an environment of tighter monetary policy would prominently feature gold as other venues for profit diminish, the Fed’s ability to continue hiking rates as planned remains dubious. There are also expectations that the Fed could reverse some of its optimistic forecasts regarding economic growth, higher inflation and a lower unemployment rate, which would provide strong support for the metal. As seen on Bloomberg, fears over trade wars and global conflict have once again pushed gold into the limelight. The metal had its best week in nearly two years after President Trump followed his steel-and-aluminum tariff signing with a particular focus on taxing China. This included a lack of exemption regarding metal imports and threats of a $50 billion bill to recapture alleged stolen intellectual property. China’s near-immediate response with tariffs on U.S. goods intensified concerns that a trade war is on the horizon, letting bullion round up the week with a 3.3% gain. The markets were also shaken up by the appointment of John Bolton as Trump’s new national security adviser. Some worry that Bolton is unlikely to apply a gentle touch when handling U.S. relations with countries embroiled in conflict, and is therefore seen as introducing more risks to the marketplace. The price gain comes after a series of signs that investor interest in the metal is growing. These include global fund holdings reaching their highest level since 2013 and a Bloomberg survey which showed that gold traders are the most bullish they have been in almost two months.